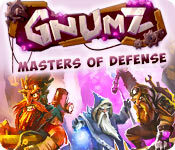 Build the ideal chain of traps using magic and the powers of the elements in Gnumz: Masters of Defense! An unknown mineral has been found in the depths of the dwarfish caverns, more valuable than gold and harder than steel. This find quickly turned sour as The Wicked King laid siege to the underground cities ordering their inhabitants to give up their entire supply of the wonderful ore.
Battle in the depths of the Iron Mountain, in the cold of the Icy Halls, in the hellish fire of the Crucible and among the secrets of the Shadow Frontier. Defeat the army of The Wicked King! Gnumz: Masters of Defense is rated 3.5 out of 5 by 8. Rated 5 out of 5 by Steamed from I love it! My first 8th Floor game was Day D Time Mayhem. I was so frustrated and furious, but I stuck with it and was soon addicted. This game is very similar, but with different weaponry, as others have described. I really enjoy figuring out how to get three stars on a level. I start with the easy levels and build up my arsenal for the harder levels. I do miss my waddling little dinosaurs that toppled over so cutely. 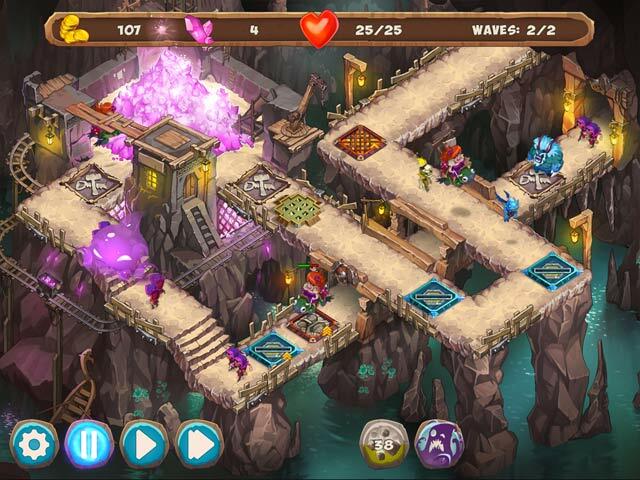 Rated 5 out of 5 by Rimmi82 from new word in tower defense games Oh! It` really great game. 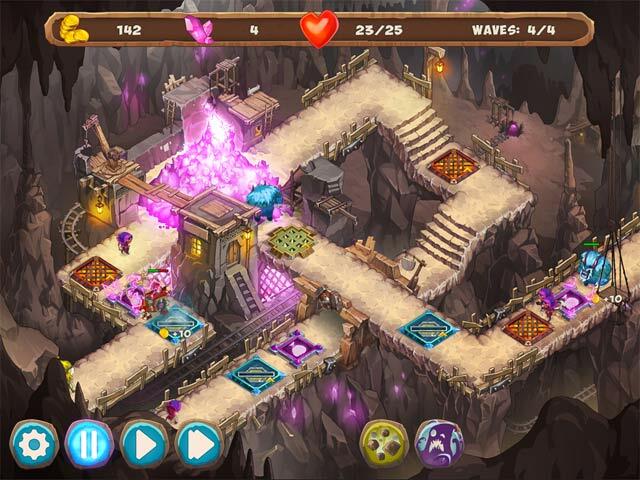 You should try it even if you didn`t like strategy games because it is also look like puzzle game. On each level you need to build build traps which damage type depends on it color. High quality graphic + a lot of levels + marvellous music + nice dialogs = great game. Rated 4 out of 5 by pennmom36 from I Fear Change Normally I'm a huge fan of Tower Defense game, but this game revamped just about every TD concept I am familiar with, thus it just seemed a bit strange. Basically you anticipate the path the enemy will approach which is indicated by an icon with a countdown timer (if you click this icon sooner you receive more points) This game is not based upon the usual weaponry such as cannons, instead the weapons of choice are elements, Earth, Ice, Fire and Shadow (why shadow is beyond my thought process) You choose which element to build on which available platforms, Stakes,Cold Scissors etc, to keep the enemy from getting to your valuable ore. There are Skeletons, Ice Trolls and Thieves to stop and you receive loot and sometimes ore for each enemy that you stop. With that loot you build the element traps and with the ore you buy cheaper or stronger defenses or miscellaneous items such as more health or a higher starting budget. The graphics are good and the game is entertaining but just unfamiliar, enjoy! Rated 3 out of 5 by DrDavid from A completely different tower game Everything from the previous tower games from this company is here again except that now the towers are traps. The villains are familiar and the traps have tower properties. Essentially these are reverse towers, but I miss the shooting. Also, the rewards are frequent but the traps are expensive. After a while you learn that magic is the answer, traps are not. I actually played one level and beat every enemy without ever buying a trap. That just killed the fun for me. You can repeatedly use rewards to buy magic but not to buy traps, so why buy traps at all? The authors need to analyze this game and start over. Rated 3 out of 5 by FrauMeike from A bit frustrating The graphics of this tower defense game are awesome, very funny and cartoonish. The weapons are different from all the ballistas and cannons that you're used to, e.g. spikes coming out of the floor and "shadow" weapons for ghosts. The music is a bit annoying and resembles the one of "300 Dwarves", but that's not a big thing, just turned it off. The game, however, is very hard. I failed to get gold from around the sixth level on and I'd consider myself expert in defense games. The problem is, that every type of weapon is for a certain type of enemy and often there's not enough space to build weapons for every enemy type. In some levels you can only build two weapons on a certain enemy path, but are facing at least four types of enemies of which some you can't kill with your choice, e.g. you build a weapon for land troops that can't kill flying enemies. This problem would only be solvable if you damage, re-choose, and re-build your weapons in every enemy wave, and to me that's a hectic massacre instead of solid defense fun. I bought the game and I still try to figure out how gold can be achieved, maybe the numerous updates you can buy will make it easier, but up to know this is a "Meh!" Rated 2 out of 5 by jellypuppy from Too complicated for a casual game This is another tower defense game from 8 floor games. In this version you have traps to set in the floor of the paths. All traps and enemies have elemental affinities. It works like rock-paper-scissors with any element being effective against 2 elements and weak to 1. However, this makes playing the game exceptionally complicated. You always have to think, what was that thing again, red? purple? and what was ok for that? It is so much to try to keep in your memory that the game is just not fun. And if you were wondering if you can replay levels to farm gems for upgrades, no you can't. It is the same X number of gems per star on each level. I miss the good ol' days when you could self adjust the difficulty by farming gems. Anyway, absurdly complicated and not that fun. Rated 1 out of 5 by wildone667 from I missed my flamethrowers! This is my first ever review of a game so bare with me. This game was just no fun for me. I love the tower defense games in fact I have all three Toy Defense and the humorous Garden Defense that started it all for me, but this.. First off there really wasn't any sense to it. I get that you lay traps but as one reviewer says, it was to confusing on what killed who. There really wasnt that many traps you could lay in the small area you covered. Unlike tower defense where you can see after the enemy stormed the castle how many men have fallen, here there was nothing, they just walked past your traps and went in the crystal wall and that was it. I could almost swear one character thumbed their nose at me, I so missed my sniper at the top of the building. Some of the characters walked to fast over the traps that it didnt effect them at all and the money you made for the ones you killed really didn't seem to upgrade your traps that much. I got so bored at one point I made all the traps the heating grill just to see what would happen. Frankly this game just wasn't it for me. I couldnt wait for the demo to end but I kept playing figuring it would get better. On the positive side though some of the characters were different. When I saw the record machine man come out it was "O.k thats new" but then when the woman came out riding a lizard and throwing mushrooms in the air, I had to get up and get a cup of coffee hoping the timer would run down, but no such luck the game went on to the trolls. sigh. Do I recomend the game? Eh. It matters what you like, its not tower defense that I'm partial to, I like setting up my strategy and knowing what weapons are needed, in fact I scare my husband sometimes and he's a former marine. Here you can't do that because there is no room. This also doesn't give you a heads up on who's coming in the wave so you can effectively set up the traps. All in all if you want to play a game of strategy, this isn't it, in my opinion, but if you want to play a game thats a little different and with quirky characters, go for it, but I highly recomend downloading the demo to make sure its what you want. An enemy is at our gates! Build an ideal chain of traps. Use magic and the power of the elements: earth, ice, fire and shadow.